Kochi: With the integrated trial run of the Kochi Metro using the signalling and communication system in the second reach up to Maharaja’s being successfully completed, the Kochi Metro Rail Limited (KMRL) authorities are waiting for the inspection by the Commissioner of Metro Railway Safety (CMRS). The CMRS will inspect the stretch by the third of week of this month, it is expected. “The testing of the signalling and communication system which began on August 26 has been successfully completed on September 7. The remaining finishing works of the station construction are progressing at a fast pace,” said a top official with KMRL. 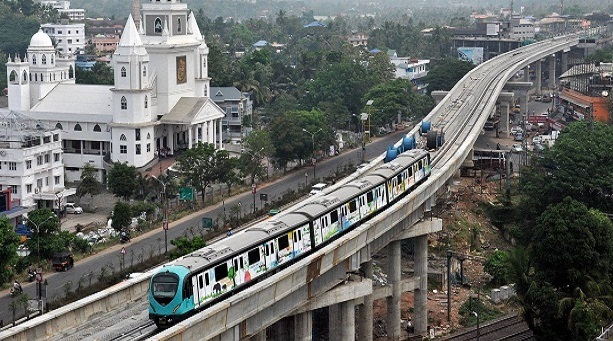 As the integrated trial run has been completed, the normal time schedule of the Metro service along the Aluva – Palarivattom route has been restored. The timings of the service was changed to facilitate the trial run. KMRL had started the trial run along the second reach with a focus on coaches, tracks and the third rail traction in July which was followed by signalling and communication testing. The Metro authorities are planning to open the stretch for traffic before the FIFA Under-17 World Cup matches scheduled from October 6. KMRL expects a significant increase in the number of regular passengers once the stretch is opened and the Metro agency has plans to introduce special packages and revisions in ticket fares.